Ueli and I slept in. It had been several exhausting days of non-stop travel and activities, so it was time for us to heal and rest for once. It was close to noon when we woke up, and around 1:30 we left. 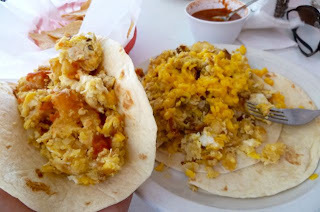 We had breakfast/lunch at a casual Mexican restaurant, having a filling set of breakfast tacos. Ok, we didn't go to just any "casual Mexican" restaurant, we went to Juan in a Million, made famous by the Travel Channel's Man vs. Food. 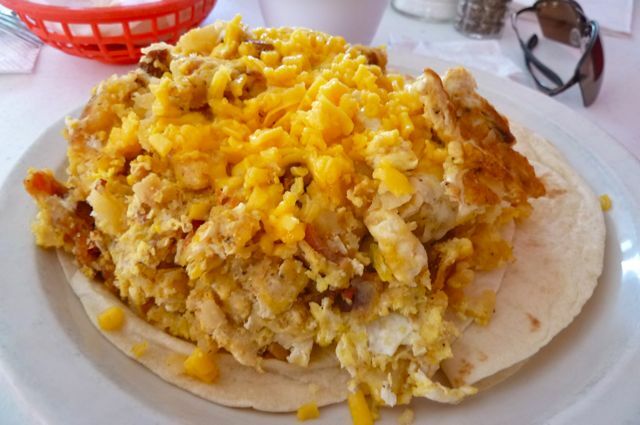 Adam Richman traveled here to take on the Don Juan challenge, to set a new record of finishing 8 of their massive breakfast tacos. 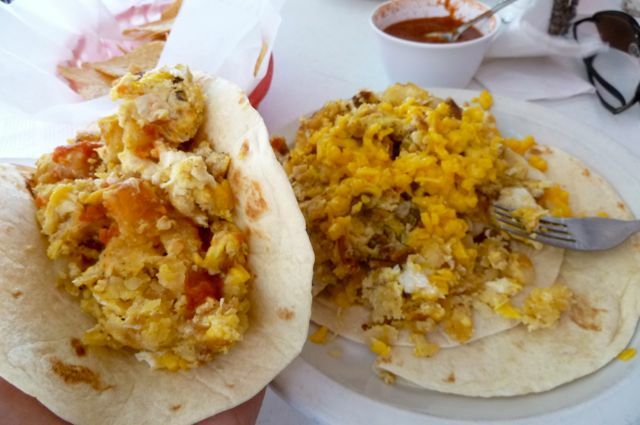 Let me tell you, calling these plates of eggs, potatoes, bacon, and tortillas simply "tacos" is quite misleading - each serving is like a double breakfast burrito. Just finishing 1 had me stuffed the whole day! 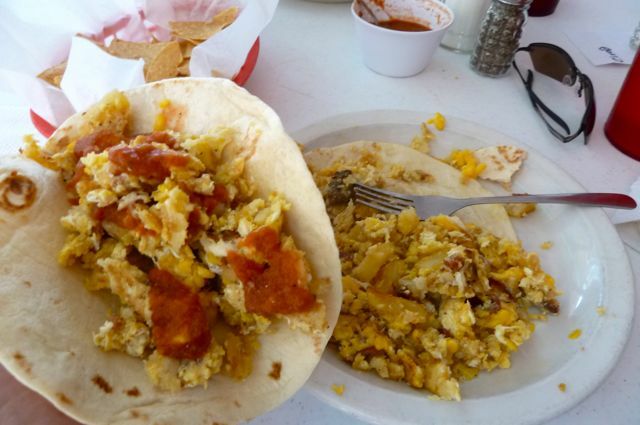 So after Juan in a Million, I check my phone and realized I had missed a call from Chris, a couchsurfer who was organizing a little get-together excursion to "Float the River" south of Austin in the small town of New Braunfels. So onto the river we went. It was kind of difficult to keep balanced with a six-pack of beers and my camera in a ziploc bag. But I managed, and I was floating down river! 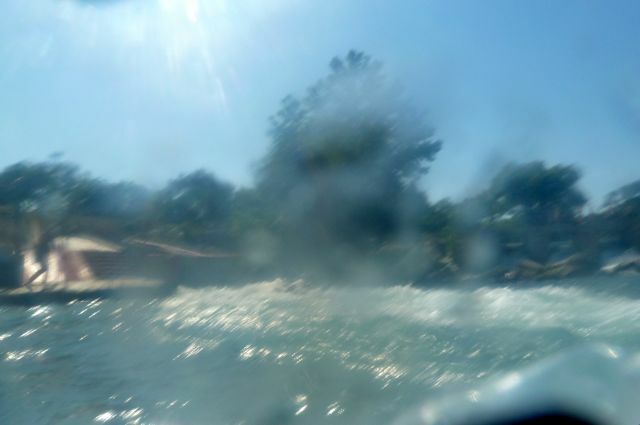 Everything was going well until the first "tube shoot," which is essentially a part of the river with a dam, but all the water (and everyone on a tube) gets funneled around the dam in a narrow waterway with roaring rapids. It was pretty fun, but as I was shot out of the funnel onto the lower river, I somehow got stuck in some vortex and was spinning around in a large circle. Around and around. I paddled furiously, but I just got sucked back in. I saw that Ueli had already floated well downriver. Minutes passed by, and I felt like more of an idiot, as more people continued to pass me. I drifted close to the right side of the river (while everyone else was pushed along side the left bank) so I scrambled to get there and at least try to get my bearings. I pulled myself up onto the slippery slope (feeling like even more of a clumsy idiot) and took off my thoroughly-soaked t-shirt. I also had reason to panic: The ziploc bag containing my camera also had a puddle of water in it! I took the camera out, took out the battery and laid it all out in the sun to let it dry. I tried to put it back together and turn it on, but nothing happened. The lens was all clouded up with mist. Taking my brand-new camera with me on a river tubing trip, encased only in a thin ziploc bag, seemed like a perfectly fine idea earlier. I guess I never got the invitation to the common sense seminar. Learning this lesson the hard way just cost me a $400 camera. A familiar stereotype of Texans (or Southerners in general) is that of backward-thinking, uneducated rednecks. Yet here I was, in Texas Hill Country, doing a stereotypically country activity, and somehow I was the stupidest person on the river. I guess that serves me right.